Made by hand. Inspired by the sea. Studio Manager and I have some exciting news we wanted share with you. For months now, I’ve been researching and looking for a charity we could support that makes a real difference to the safe-keeping of our beautiful oceans and (drum roll please…) have finally found one! The Marine Conservation Society will be the charity we support! Yay!!! 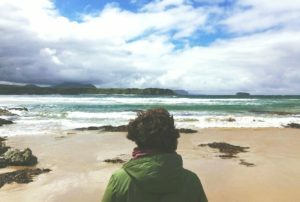 The Marine Conservation Society has a Scottish branch and their incredible work to clean up the seas, save marine mammals and ocean wildlife AND educate children about the importance of keeping trash out of our oceans is incredible. 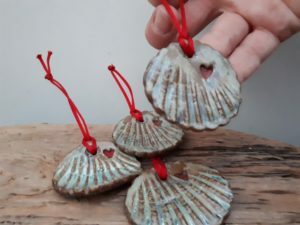 So, 100% of the proceeds from every sale of our ‘In love with the sea’ ornaments will be donated to the Marine Conservation Society and I am thrilled! If you’re ever looking for a special something for yourself or that person who has everything, click here and look no further! 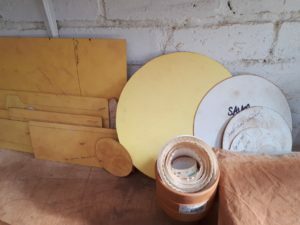 When we left, we were talking about templates & composite parts of pots… here is a look at the templates I am using in the studio just now. They’re made of mounting board which is sturdy and allows for many pots to be cut to size before the edges and corners start to deteriorate. Someday soon I will transfer these mounting board templates to tar paper which lasts indefinitely, but for now, this is an excellent template material. So, once we have our shapes cut out they are then manipulated in various ways with my hands or forming over a bisque mold made of clay. 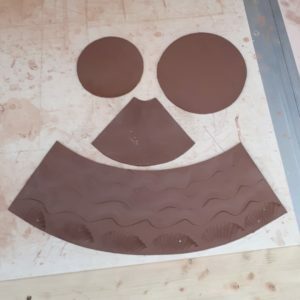 Here is a speedy video of a mug being formed after resting for a few hours in partial plastic covering… partial because I need the feet to set up so they can support the mug without collapsing as the wet walls are being pushed out. So there you have it, a whirlwind tour of the process of working with soft slabs. If you have any questions, let me know and I’ll do my best to answer them. #marchmeetthemaker Have you heard of it? It is a campaign on Instagram that was created by a wonderful maker called Joanne Hawker to bring more awareness to handmade business and to makers… I’ve just discovered it myself and am loving being a part of it. There’s a prompt for every day in March that we all speak to, yesterday was all about “How we got started”. This movement on Instagram is a really big deal for a lot of reasons, not only because it has given me a focus for the month for insta posts (hoorah!) but also because it has gotten a lot of people to thinking about things that don’t usually enter our head… such as how much handmade business brings to the economy, and how many makers are out there, and how many ways there are to be creative (I really had no idea how creative we all are!). Because I’m a potter and ADORE wearing handmade jewelry, I tend to lean toward thinking only about clay or sketching or metalsmithing when I think about creativity. Holy smokes, is that narrow minded! 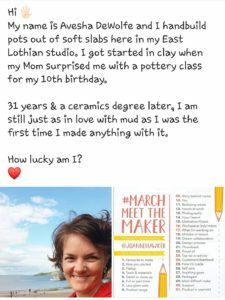 In your free time this month (and if you’re on Instagram) I urge you to check out the #marchmeetthemaker movement happening over there and follow our posts too, click here to find Studio Manager and I in InstaLand. Process… it’s such a bland word for a really amazing set of steps used across a bazillion art forms. If you think of a better word for this, let me know, okay? 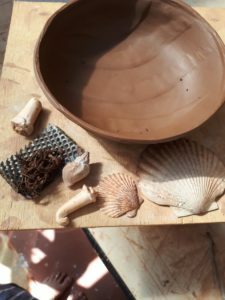 Anyway, many of you ask me often about the steps used to make the pots here in Spiral Tide Pottery so I thought I’d let you in on the process of making each pot that leaves the studio doors. First, we start with a 1/8th inch thick slab. Studio Manager overseeing the process. 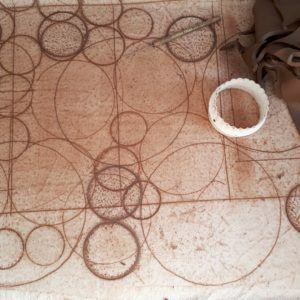 I used to roll them out by hand, it was meditative and calming to send that rolling pin over and over and over and over the clay… however, it took AGES and I quickly found that the wear on my wrists & shoulders was adding up. After much deliberation, Studio Manager and I decided to invest in a slab roller and what an amazing difference it has made. Since the arrival of ‘Lola, the SlabRolla’ production has been able to speed up while wear on my body has lessened. 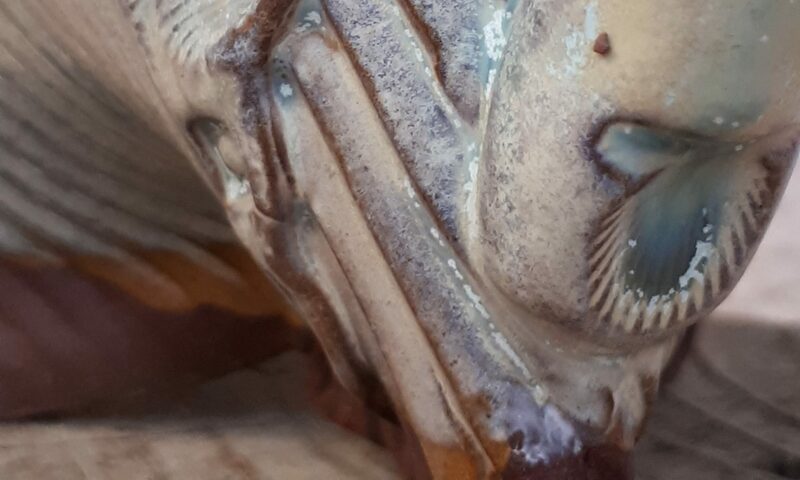 After the clay slab is rolled out, it gets textured with various tools, handmade stamps and found objects to create the surfaces that work best for the glaze I mix (my glaze needs break points and pooling areas to work it’s best magic so texture is crucial). After texture is added to the slab it is trimmed to size for the pots I’m making using a template I’ve created out of paper first to test it out then it’s cut from very hard card stock to last a bit longer. Sometimes only one template is needed for a pot, sometimes it’s multiple… this teapot form for example has 4 parts to it. The slab parts are then left to set up a bit after being cut out. If I try to rush this part the slab turns to a floppy mess covered in fingerprints so this is when a tea break happens or I move over to previous slabs that have been setting up while making these new pots. When it’s timed right, there’s always something needing done and not a moment of ‘down time’… 8 hours can go by in a flash and only the grumbling of my stomach or the urgent need to pee can make time stop again. It’s both beautiful and a bit dangerous to lose track of time that completely so I’m working on having a break becoming part of the fabric of my studio days rather than an afterthought. It’s unbelievably cold outside this morning as I write this, even the sand at the beach had a light coat of frost on it… I wish I had thought to get a photo of it to show you. Ah, well, next time! 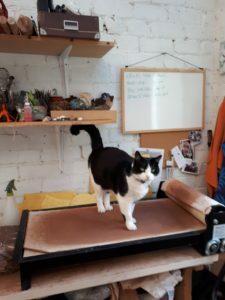 Some of you who have been a part of the pottery family for a while may have been wondering where Spiral Tide Pottery has been over the last few years… I closed the pottery back in 2016 when my previous studio was sold back to the council. Everything was packed away in the shed in our back garden for years, calling to me, but I was doing my best to ignore it because I couldn’t see a way to make it work. I couldn’t find an obvious solution so I ignored that part of myself screaming for expression… until my eye began to twitch and I became a not very nice person. I was trying so hard to be my best but I was so unhappy. 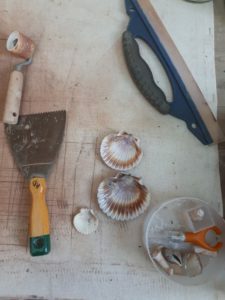 My wonderful, sainted, ever-so-patient Wife came up with a brilliant solution last spring and after a month of construction on the shed that was holding onto all the pottery equipment…Voila! I have a working studio that I adore. As of May 31st 2018 we’re back in business and I’m a nice person again, holla-lujiah! One of the things the last few years without clay has taught me is to always – ALWAYS – do my very best to honor my creative spirit. It’s a constant companion and something that won’t be silenced. 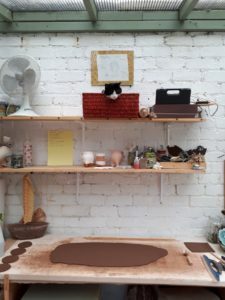 At the risk of sounding totally dramatic… I’ve learned that clay is something almost as important for my well-being as oxygen. Because I tend to want to learn from my mistakes (and because I worry), I’ve been thinking a lot lately about what happens the next time I need a plan B for the studio and how to keep my hands in clay no matter what. Even if I can’t see a way to fire the work I know now that I still need to be getting my hands dirty and making pots. The kicker of that lesson though, is that I already knew it… waaaay back in 1995 when I was getting ready to graduate from high school and didn’t have a clue what I wanted to do with my life, my Mom asked me “can you live a happy life without art, without making pots?”. My immediate answer was no and that led me to apply to art school, but 19 years later I had forgotten all of that. I had forgotten that I deserved to have my soul alight and I’d forgotten that the best way to be my best self is to get lost in my creativity as much as possible. So, I urge you to have a think about the things that make your heart sing, the talents and special gifts that you can’t live happily without and then make damned sure you find a way to keep them alive for you in your daily life no matter what. Don’t forget that you deserve to have your soul lit up on a daily basis, k?